A month or so ago, I had an email from a Dr Lucy Rogers (@DrLucyRogers), who wanted to talk about human-sized animatronic dinosaurs. Animatronic dinosaurs are much more interesting that what I normally get to talk about on a Monday morning, and we’ve been in touch since then, the culmination of our dinosaur conversation being the video below. The dinosaurs in question are at Blackgang Chine, a theme park on the Isle of Wight. They’re now pretty ancient, and were programmed a very long time ago with a limited range of behaviours (roar, lift stompy little foot, move head, repeat). The original hardware is so old it might have seen some real dinosaurs, so the challenge that Dr Rogers’ team had set themselves was to update the park’s dinosaurs to have longer, more interesting and more variable behaviour loops – using Raspberry Pis. Dr Rogers was helped by Pi veterans Neil Ford (@neilcford) and Andy Stanford-Clark (@andysc) – all the programming was done in Node-RED, which we’ve recently been exploring ourselves via workshops at the Cambridge Raspberry Jam – it’s a nice way to visualise flows of events. Later in the year, Dr Rogers will be visiting a Chinese animatronic dinosaur factory (I am so jealous), explaining how they used Raspberry Pis in their control boxes, and leading some tutorial sessions. We’ve already hooked her up with some user groups in China; we’re looking forward to finding out what she gets up to! 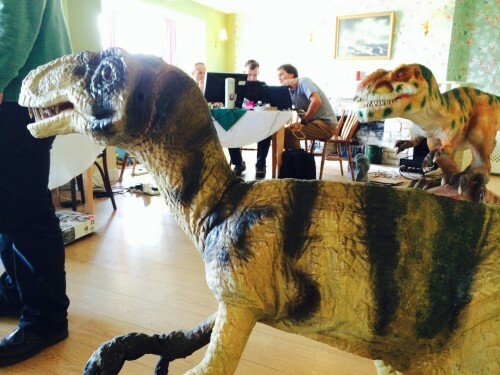 That is great – there’s not many Jams where you get to play with a dinosaur! I’m sure there would be a market for programmable toys similar to these but smaller, which would be good for engaging children. With the Raspberry Pi they could easily add a web interface or mobile app and have the visitors make the dinosaurs execute their self-invented (albeit restricted :-)) sequences. Wow not only a Pibrella Spot but bring back some very fond memories of Blackgang Chine. wonder if they will retro fit the devils head where you could stick your arm out of its nose. What was the graphical scripting language I saw around 0:45? That’s Node-RED – link in the article. A great story. Will anyone be writing this up in a bit more detail? It soulds like a case study that a lot of readers might benefit from. We’re hoping for some more from Blackgang Chine after Dr Rogers has been to China – watch this space! This is so freakin’ awesome!!! Can’t wait for those tutorials!